I first started with marketing automation nearly a decade ago. In 2011, I got certified in Marketo — and never looked back. I’ve used Marketo in large enterprise companies and in small technology startups. I think it’s a really great tool. And I’ve found that when it’s used effectively, it’s changes the game. I think that one of the reasons Marketo itself has been so successful is because they listen to their community. As a user, you can suggest and vote on different features, indicating what you think is most needed in the platform. If a product request gets enough votes, Marketo will consider adding the request to the product roadmap. That said, Marketo is a complex product and you want to be strategic about how you use it. There are four core methodologies that are key to being successful with Marketo. 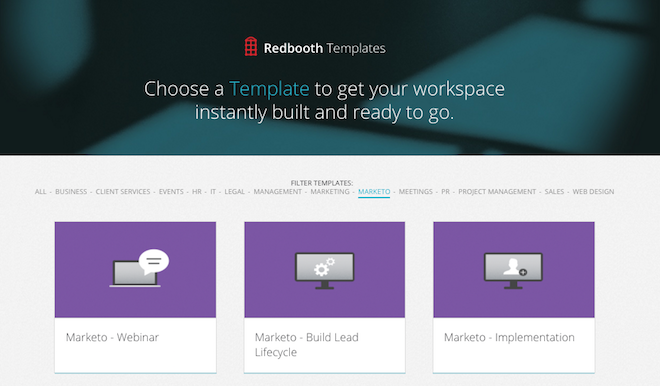 When I created the new Marketo-themed templates for the Redbooth Workflow Template Library, they guided my approach. Here, I’m going to walk you through the four methodologies, and then explain how you can use these templates to manage your marketing campaigns more effectively. Of course, they’re designed for Marketo users, but I’m going to let you in on how you can get a lot of value out of them even if you use another marketing automation system (or no system at all). Having a plan is where it all begins. Marketo isn’t going to do that for you — it’s going to give you a powerful infrastructure to implement your plan. Take the time to develop your plan in advance. It’s going to make your entire process run more smoothly. With Marketo, having established naming conventions for everything you’re creating is very valuable. I see a lot of organizations that just throw it in there. They say, “We’ll figure it out later.” Well, unfortunately you’re probably not going to figure it out later. Slow down at the beginning and get it right, because spending that extra five hours at the beginning is going to save you hundreds of hours down the road. The third piece is connecting with your CRM. If you’re already familiar with marketing automation, that might sound obvious. But trust me on this: Don’t just assume that because it’s connected, you’re all set. It’s just not how it works. Make sure that you have a very clean connection with your CRM and you know exactly what’s going on. Do this at the beginning of your process if you can. It will help ensure that information is going where it’s supposed to. The final piece that determines Marketo success is simple: commit to it. That means committing to it as an organization, not just as an individual. This may mean having a person whose primary role is running point on all things Marketo. You have to invest in it like anything else. You could run Salesforce on your own, but without an admin who’s managing processes and housekeeping, it’s going to become a challenging situation. So get that organizational buy-in and commit. Redbooth workflow templates help you plan, manage, and track processes, so they have great potential for helping you get more out of Marketo (watch a video on using Redbooth templates). So there are all these pieces to keep track of, both this time and every other time in the future. Let’s say, for instance, that you’re planning a webinar. Open up the webinar planning template, and you’ve got everything you need for planning and promoting your webinar in Marketo. It’s your checklist. You don’t have to think. You don’t have worry, “Did I set that reminder?” or, “Did I get the invite list yet?” or, “Do I have content?” It’s all there. 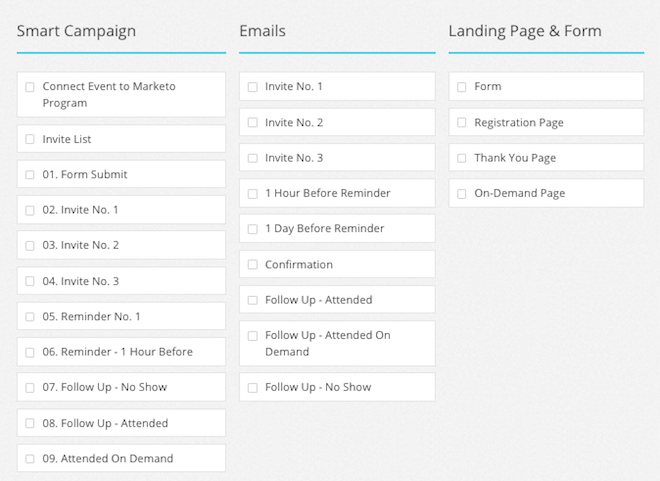 Templates are super-valuable for recurring events, or any event where there are multiple pieces. If you take the time to set them up, they also allow you to be more agile and move faster. Well, four weeks later when you’re doing your next monthly webinar, you forget again, because maybe you wrote it down and maybe you didn’t. What if you could just fix it in your webinar template? That way you could know it’s right every time going forward. You can check out all of the new Marketo templates — and even if you don’t use Marketo right now, you can still use the templates. Once you launch them in a Redbooth workspace, the templates are fully customizable. So you can tweak the template so that it works with whatever system you’re using, even if you’re not using marketing automation at all. The basic principles don’t change whether you’re a team of one or a giant marketing team at an enterprise company: Prepare in advance, be organized, make sure your technology is working the way you want it to, and get organizational buy-in. Be able to track your results — and don’t reinvent the wheel if you don’t have to. These Marketo templates will make it easier for you to do all of that. Sierra brings an in-depth knowledge of demand gen and marketing automation platforms and best practices and interim management. Early in her career, while working at SuccessFactors, Sierra fell in love with SalesForce and Eloqua and has been working with these platforms for over 8 years. Her passion led her to become well versed in Pardot and gain her Marketo Certified Expert certification.